Wow! Now that's more like it! Boys and girls, this is a real, powerful Power Metal band! 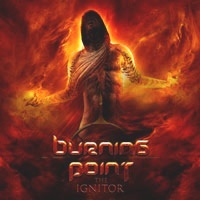 BURNING POINT has created one of the best Power Metal albums that I've heard of late. They say that they are here to free the fire and you know what? I believe them! And most importantly, they have managed to free the fire time after time. I've been thinking who I should give the credit for this amazing work. And honestly, all the band members work in such a perfect coordination that I'm proud to say, everyone can get the credit for this awesome album! "The Ignitor" is a great opportunity for all the melodic Heavy Metal, Power Metal fans to enjoy such a varied album, especially from instrumental parts and the amazing vocal range of Pete Ahonen. The greatest thing that BURNING POINT is the fact that they use keyboard effects which changes the game: creating new rules, new décor and make it so different from most Power Metal bands. The only thing that is missing is even more harmonic guitar solos. Maybe even it is best to combine both keyboards effects with guitar solos. The drums work is absolutely amazing as well. Do not forget, dear friends, that a great drums work is the basics of a good album no matter in which musical genre. In conclusion, the flame of BURNING POINT is eternal. Bring the "Demon Inside Of You" and I hope you'll like it as much as I did.